Shohei Ohtani has been the story of the 2018 MLB season. The rookie phenom from Japan has put together one of the finest debuts in MLB history. He has instantly become one of the game’s best pitchers, and at the same time, one of the games most feared hitters. His skill set both on the mound and at the plate have not been seen in the game for nearly 100 years and can be described as Ruthian. He hits for a high average with power, his fastball consistently sits in the high 90s, and he has a split finger pitch that virtually no one can touch. Ohtani is also gifted with blazing foot speed and is one of the fastest runners in baseball. He is Ruthian, but with blazing speed. To commemorate Shohei Ohtani’s memorable debut, Bigtimebats.com, in connection with Ohtani, MLB, and the MLBPA, is proud to release this exclusive Shoehi Ohtani MLB debut art bat. 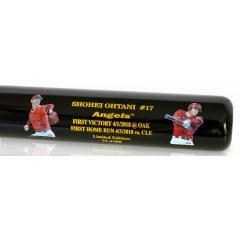 The bat features the Angels’ logo and the dates of Ohtani’s first win as a pitcher and first home run as a hitter. The dates are between two pieces of exclusive reproduced artwork of Ohtani by renowned sports artist, Jolene Jessie. The bat measures 35 inches, weighs 32 ounces, and is officially licensed. Get your historic debut bat before they sell out!